Great Task is a free Windows 8 Task Manager app that allows you to create and manage tasks with ease on your Windows 8 or 8.1 device. When you launch the app, you will be presented with a minimalistic interface with pretty much all self-explanatory buttons. If you don’t understand what the buttons do just by looking at them, don’t fret! We’ll be talking about them in detail here. Great Task is a good tool that also allows you to sync your Google tasks to the app by allowing you to log in to your Google account by the click of a button. The tasks can be created as easily as pressing the plus button, inputting information about the task, and setting a reminder! Great Task is available as a free download from the Windows App Store. When you launch the Great Task app on your Windows 8 or your Windows 8.1 device, you will be presented with an interface which will present you with various options as illustrated in the below screenshot. We have illustrated the function of the important buttons in the above screenshot. The pane at the left side of the screen allows you to view and manage your upcoming tasks just by clicking on the category of tasks (Today, Tomorrow, etc.). You can create new task lists via the + button in the pane at left towards the top. The button next to it allows you to remove the lists. At the bottom of the screen is the sign in button that allows you to sign in to your Google account and sync the Google tasks. Do remember that if you are prompted to allow background access, allow it as it will then show you notifications on your lockscreen with ease! Let’s start by linking our Google account. Click on the red G+ sign in button at the bottom left of the screen. Now you will be prompted to enter your Google login information, and once you have entered that successfully, you can then log in and soon enough, you will be able to see your account information at the bottom left of the screen. The screenshot below shows that I’m logged in to the app if you look closely at the bottom left corner of the screen. 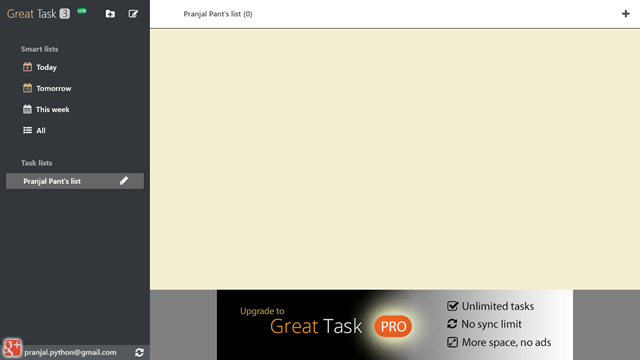 You can also see that under Task Lists pane in the left side of the screen, you can now see Pranjal Pant’s list. This name is automatically assigned to your first task list if you don’t have any task lists on your Google account. You can also edit this name by clicking on the pencil icon placed next to the list name on the left side of the screen. To add a new task to a list, simply click on the list at the left pane, and then click on the plus button at the top right corner of the screen. You will then be provided with the task creation screen. Enter the required details, and your task will be created. You can also set a reminder for your task when you want to be reminded about the same. You can also create multiple task lists by using the plus button in the top of the pane on the left. Note: Plus button on top left creates new task list, and plus button on top right creates a new task. To mark a task as completed, simply access the task list on which the task is stored by clicking on the appropriate task list at the left side of the screen, and then in the pane on the right, click on the check box next to the task that you want to mark as completed, and soon enough, you will be shown a strike-through through the task name, marking it as being completed! You can also clear this checked task by right clicking to access the control bar, and clicking on the Clear Completed (which happens to be the only button on the control bar) button. And now, as if by magic, your completed task will disappear from the screen! This basically concludes the how-to on using the Great Task app for Windows 8 and Windows 8.1. I do hope that you will enjoy using this app! You can also check out a similar app which allows you to create and manage your tasks, Task2Do. What I like about this app? Tasks can be sorted according to timings, and even if the tasks are present in multiple lists, the tasks can be viewed together on the same screen by clicking on the Today, Tomorrow or This week button on the left side of the screen. Option to sync the app with Google tasks. What I don’t like about this app? The app may get complicated for some users. Background notifications and reminders for task completion don’t always work! Great Task happens to be a decent app for Windows 8 and Windows 8.1 devices. The ability to link your Google account to the app happens to be a cool icing on the cake, and for the most part the app is free from any or all major qualms. You can grab this app for free from the Windows Store, and trust me when I say that this app is truly worthy of getting a 3.5 out of 5!